Slumberland ? Royally comfortable, representing the best of British craftsmanship for almost a century! The “Rêves de luxe” collections offers you warm, soft and voluptuous nights. You won’t be able to imagine anything better than to snuggle, sleep and dream! If you’re looking for perfection — and good sleep — Slumberland, a gem of British craftsmanship, is just for you. And it’s now available at Luxury Bed! 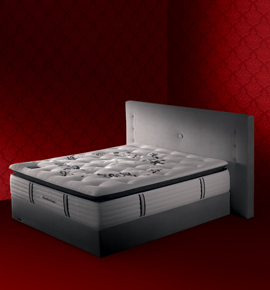 Slumberland, the expert’s brand since 1919. Slumberland, founded in 1919, offers to this day the best of luxury bedding : a prestigious name, offering a rare combination of state-of-the-art technology, traditional craftsmanship and luxurious design. All this aimed at making beds specially for you, to your specifications. 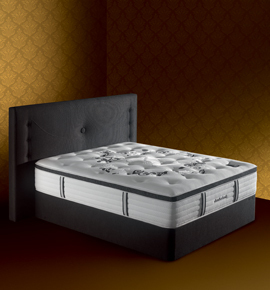 Are you hesitating between the « Covent Garden », the ultra comfortable latex and foam bed, the « Notting Hill », made from memory foam which eliminates all pressure points, and the « Kensington », especially popular for clients seeking firmness with it’s high density cover foam and associated suspension? Then contact us. Our experts will answer all your questions without delay, either by phone : +33 (0) 4 78 37 59 30, or by email : lyon@luxurybed.fr, or in our shop in Lyon, 10 cours de la liberté 3ème, or by appointment at your home, according to your availabilities. We are determined to offer a premium service that puts your comfort above all else.